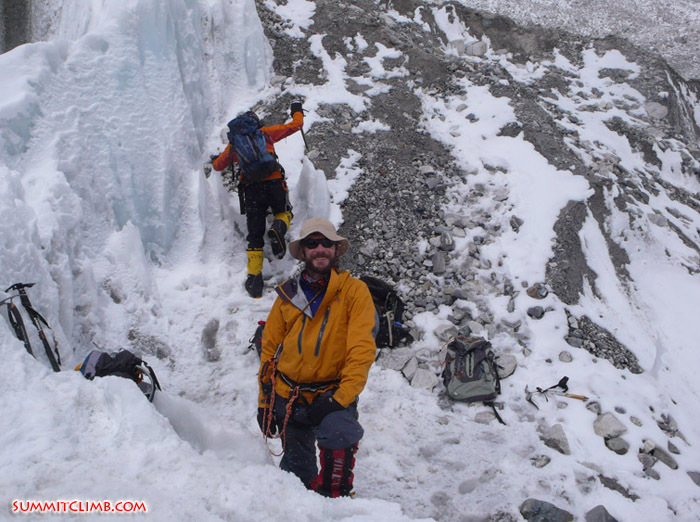 Photos in Cho Oyu slideshow: David Lepagne, Guntis Brands, Phil Crampton, Johan Frankelius, Herve Coron, & Thierry Auberson. Hi, this is Max Kausch writing a dispatch for the Cho Oyu expedition spring 2010. I apologize for the lack of communication since the last transmission from camp 3. Alex, Palden, Gelu and I managed to go down safely to ABC and dismantle all camps on the way. Late afternoon on may 25th, we finally met Mia and the staff at basecamp. The cook made us a cake that night! Alex was doing very well considering he has just climbed a 8200m peak WITHOUT OXYGEN! On the 26th we started the packing and trekked to Chinese basecamp where the TMA provided jeeps to transport us to the border. Today we finally crossed the Nepali border and saw trees and civilization after a whole month. Kathmandu is receiving a lot more rain now and has a lot less power cuts than before we left. We'll shower and eat everything we wished during this past month and write more details of our arrival very soon . 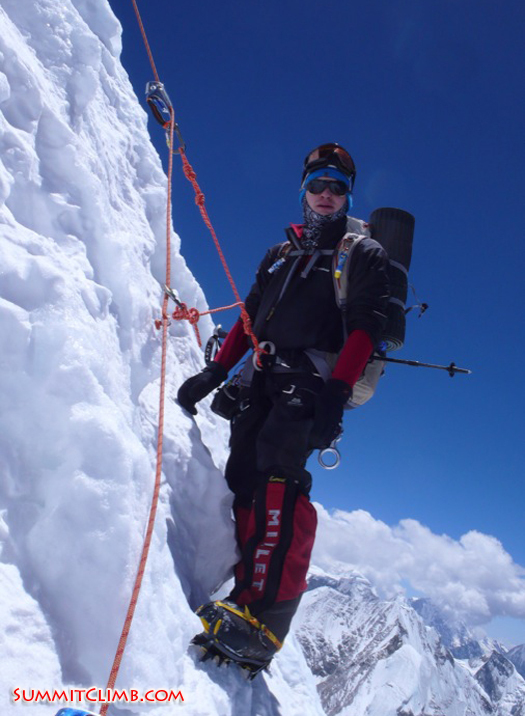 Hi, this is Max Kausch calling in a dispatch from the summit of Cho Oyu! I’m here with Palden and Alex. It’s snowing at the moment and we can’t see much. We made it safely. It took us 8 hours. We’re going to start down now and will ring you when we’re back safe in camp. Thank you for following the news at SummitClimb.com. Bye, bye. Sunset from camp 2 (Mia Graeffe). Hi, this is Max Kausch calling in a dispatch for the SummitClimb Cho Oyu spring 2010 expedition. We’re back to camp 3 now. We just summited today. Alex and I are here in the tents now resting a little bit to go down tomorrow to ABC. We feel quite strong. Hopefully we’ll make it to ABC tomorrow. We have Palden Sherpa with us to help break down camp. Palden and Max on the summit. Mark during the glacier training. Mia, Alex and Max at 6700 metres (Max Kausch). Mia appreciating the views during an acclimatization walk at 5300 metres (Mia Graeffe). Hi, this is Max Kausch calling in a dispatch for the SummitClimb Cho Oyu spring 2010 expedition. Today is the 23rd of May. We’re currently at camp 3, which is just over 7500 metres/24,600 feet. It’s pretty cold up here with some snow falling. We hope it’s going to clear tonight. I’m here in the tent melting snow with Alex. We’re going to have about 6 or 7 hours of sleep before going for the summit. All 3 sherpas are here as well. There is another expedition here with us too. We hope to push for the summit together with them. Mia is back safely in advanced basecamp. We miss her a lot and will see her in a few days. 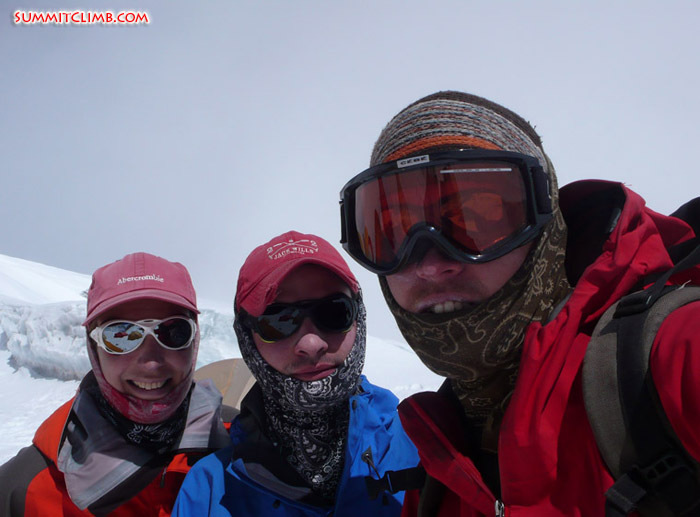 Our awesome spring Cho Oyu expedition team (Max Kausch). Above 7200 metres (Alex Holt). Mark trying on his new hat in basecamp (Mia Graeffe). Alex and Max climbing the ice cliff (Mia Graeffe). Hi, this is Max Kausch calling in a dispatch for the SummitClimb Cho Oyu spring 2010 expedition. Today is the 22nd of May. 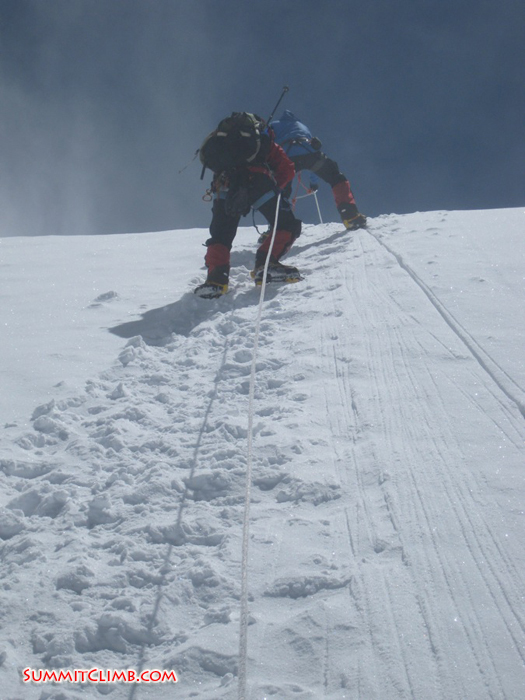 We’re currently at 7100 metres/23,300 feet in camp 2 during our summit push. 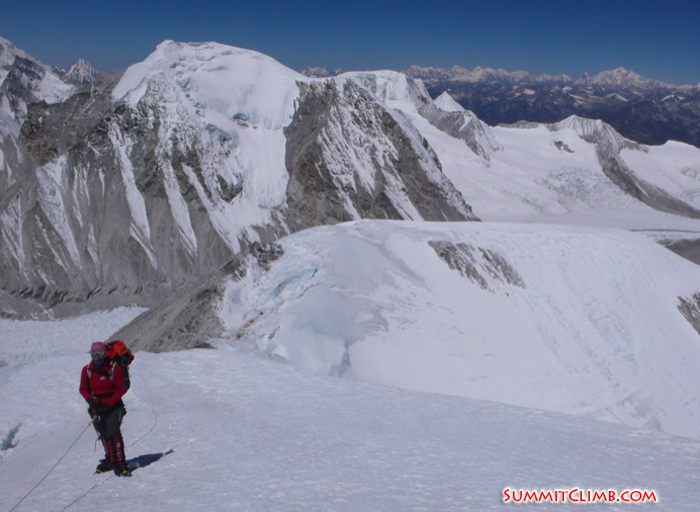 We are heading to camp 3 tomorrow, which is at 7500 metres/24,600 feet. We’re feeling very well here. It’s the 1st night we’ve felt perfectly well, eating and drinking as much as we can. It’s 9:30 p.m. and we’re going to sleep. Mia unfortunately couldn’t make it to camp 2 today. She was not feeling well and went down to camp 1 and is safe there hydrating and eating. She will try to head up to camp 2 tomorrow, which means that she is going to go for the summit on the 25th if she feels well. Yaks in ABC (Mia Graeffe). Shimy, our awesome cook, serving pizza in ABC (Mia Graeffe). Hi, this is Max calling in a dispatch for the SummitClimb Cho Oyu spring 2010 expedition. Today is the 20th of May. Today is a rest day before the summit push. We’ve been resting here for 2 days. Our batteries are properly recharged and we’re heading up to camp 1 tomorrow after lunch. I’ve been trying to match up with the different weather forecasts and it looks like the 24th will be our summit date. Right now, Dan Mazur and the SummitClimb team are on Everest North and have been sending us wind forecasts, which is how we established that date. It seems that the monsoon is fast approaching this year and didn’t leave a lot of windows for climbers to summit Cho Oyu. It looks like the monsoon clouds might hit the central Himalayas on the 27th. We plan to leave ABC on the 26th to go back to Kathmandu. It snowed a lot in ABC last night and it’s currently snowing here at 11:00 p.m. The camp is white again and there was about 10 cm of snow this morning. 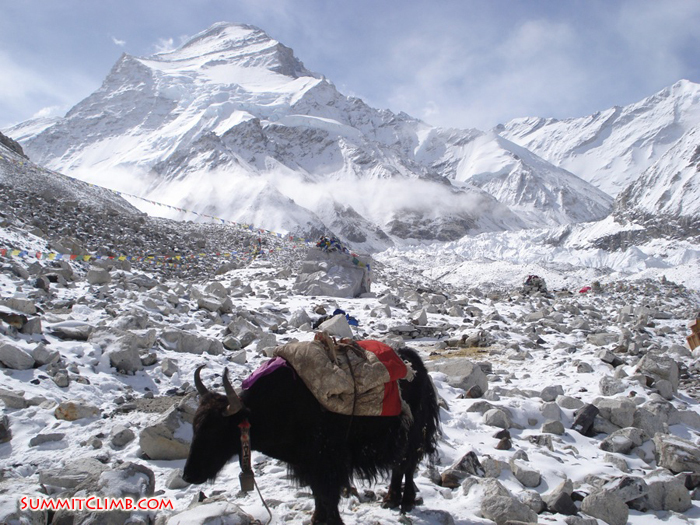 This morning we saw a yak caravan crossing the Nangpa La pass going to Nepal. They have closed the pass for about 4 years, although they’ve been using it for about 500 years to trade things like salt, butter, and clothing. We’re happy to see the pass being used again and hope it continues. ABC is really empty now. There are only 2 official expeditions here. We can count the remaining people on our hands. Today there are 13 people counting the sherpas. That’s all of the people left who are going to try to climb the mountain. 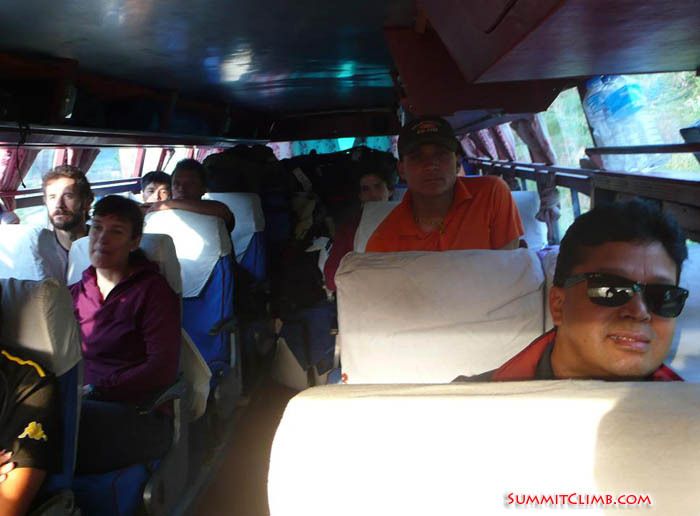 Most of the expeditions abandoned the mountain and left to go back to Kathmandu already, so there are very few climbers left. Team getting ready for the 2nd trip to camp 1 (Max Kausch). Mia above camp 1 (Max Kausch). Hi, this is Max calling in a dispatch for the SummitClimb Cho Oyu spring 2010 expedition. Today is the 18th of May. We are very happy now to finish our acclimatization climb back to ABC at 5700 metres, which is not too low. There are about 4 teams at the moment in basecamp, so most of the other teams have left already. One team went to the summit 2 days ago. Apparently 2 members and 2 sherpas summited. Congratulations to them! They have been here for about a month. We and the other teams are staying as late as possible to go for the summit. The weather forecast says that the 24th will be ideal due to low winds. There’s also some snow forecasted, so we’re not sure when the magic day will be. We’re planning to go to camp 1 on the 21st, camp 2 on the 22nd, camp 3 on the 23rd, and then push for the summit that very same night and be back to camp 2 on the 24th. Max and Mia above camp 1 (Alex Holt). Alex climbing a rockband at 8000 metres (Max Kausch). Hi, this is Max calling in a dispatch for the SummitClimb Cho Oyu spring 2010 expedition. Today is the 16th of May. As the weather forecast promised, yesterday and today were both good days. We used the window to sneak to camp 2 and acclimatize. 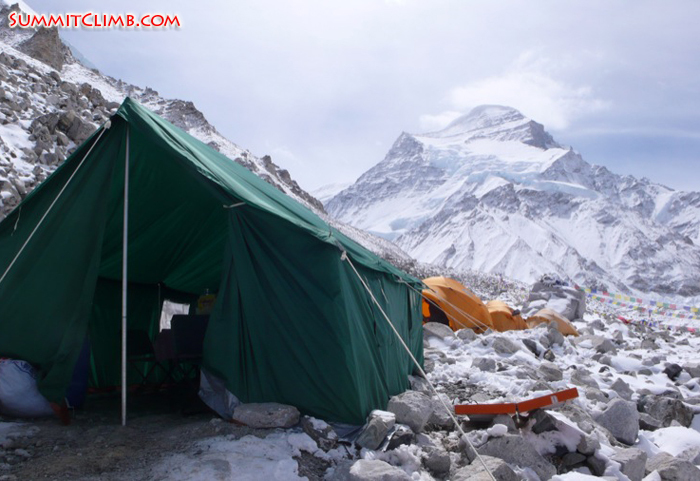 Camp 2 is higher than any mountain outside of the Himalaya at 7100 metres/23,300 feet. Everyone is doing well here. Mia and Alex are in the tent next door. 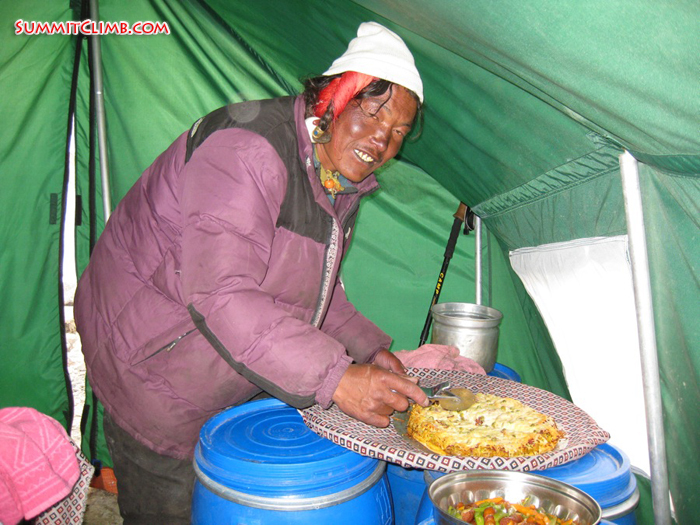 I’m sharing a tent with Palden Sherpa. 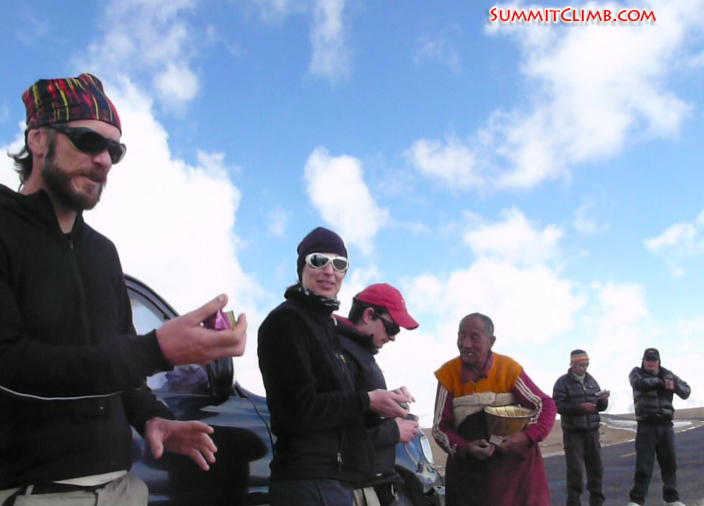 We’re trying to hydrate and eat as much as we can so the acclimatization goes well and altitude doesn’t have too much impact on our bodies. 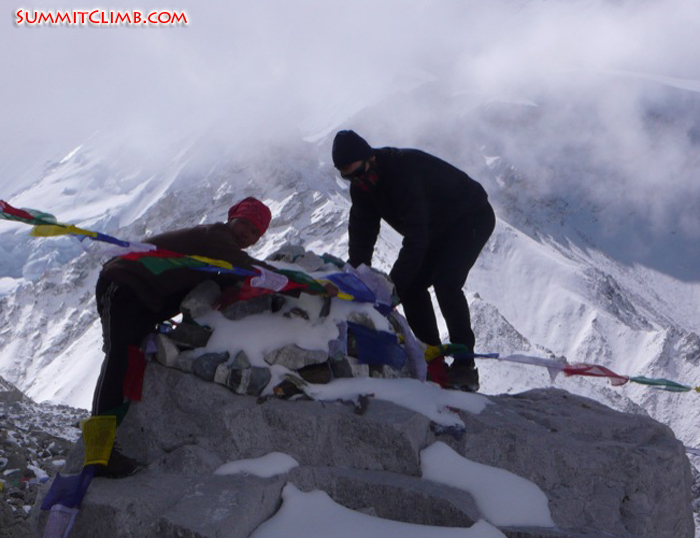 There was a member from another team that wasn’t too lucky with the acclimatization and passed away at 6700 metres. Our sherpas, Ang Gelu and Ngima Kanchha, went down there today to help with recovering the body. We hope they are doing well. Apparently they are to camp 1 already. We are all sending our deep condolences to the other team’s member’s family, friends and climbing mates in basecamp. Alex above camp 1 (Max Kausch). Alex hanging on an ice cliff at 6700 metres (Max Kausch). Hi, this is Max calling in a dispatch for the SummitClimb Cho Oyu spring 2010 expedition. Today is the 14th of May. We’ll try to head to camp 2 again. We couldn’t make it last time due to strong winds that forced the team back to ABC. The winds have slowed down a bit, but are still strong. There are still a few other teams here. Some teams have been here for over a month (33-35 days) and they are all leaving today. About 7 teams have left the mountain. I think there will be about 3 or 4 teams left here by the time we’ve finished. To be fair, the first clear days of the month weren’t too long ago. Last week we had 3 clear days, so it’s been a very snowy spring. The Everest North team has had a lot of snow and wind as well, so it’s not just us. Now we’re relying on the weather forecast that says the 15th and 16th shouldn’t be too windy. We hope to fit our acclimatization climb into those 2 days. This means going up to camp 1 today on the 14th, sleep there at 6400 metres for our 4th time, then head to the 1st ice cliff at about 7000 metres and sleep there for at least 1 night on the 15th. If the next day is good, we’re going to try to sleep there on the 16th as well. By doing that we might finish our acclimatization plan, then come back to ABC to rest for 3 days before finally pushing for the summit. The forecast says there will be a good window starting the 21st, so probably the 21st or 22nd our sherpas and us will be working really hard to fix the route and reach the summit. We’ll see what happens with that. All of the members are doing well. Mia and Alex are doing very well and have acclimatized really nicely. They’ve spent 3 nights at almost 6500 metres. We heard that Tony and Mark made it safely to Kathmandu. We really miss them. Unfortunately, they couldn’t adapt properly to the altitude. I believe Mark is flying to Australia today, but we don’t much about Tony’s luck with the flights. Hopefully he’s gotten lucky and is flying to the States soon. So we hope that they have a great time back home. TMA ruck on mountain pass (Max Kausch). Team throwing prayer flags at 5000 metres (Max Kausch). Hi, this is Max calling in a dispatch for the SummitClimb Cho Oyu spring 2010 expedition. 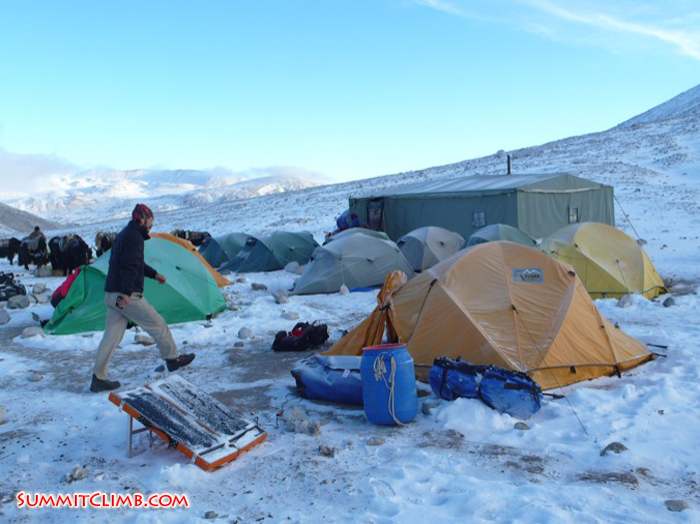 The team is trying to make an acclimatization trip to camp 2 to spend two nights there, but it is a bit windy at the moment. 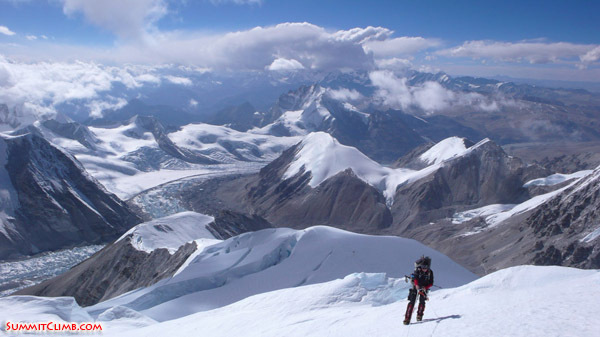 There are a few expeditions leaving Cho Oyu. I think there are 6 or 7 expeditions left on the mountain. We’re trying to do negotiations to fix the route because it looks like we are going to have to do it ourselves. Mark left and is on his way down to Chinese Basecamp. He will cross the Nepali border tomorrow and we’ll all miss him. The rest of the team; Mia, Alex and I are trying to get to camp 2 at the moment. 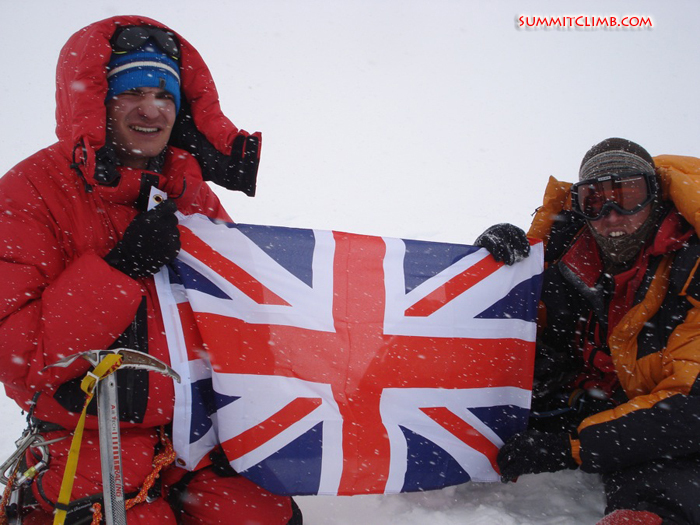 This is Alex Holt calling in a dispatch for the SummitClimb Cho Oyu spring 2010 expedition. Mia, Max and I are currently spending our 2nd night at camp 1, which is at 6400 metres/21,000 feet. 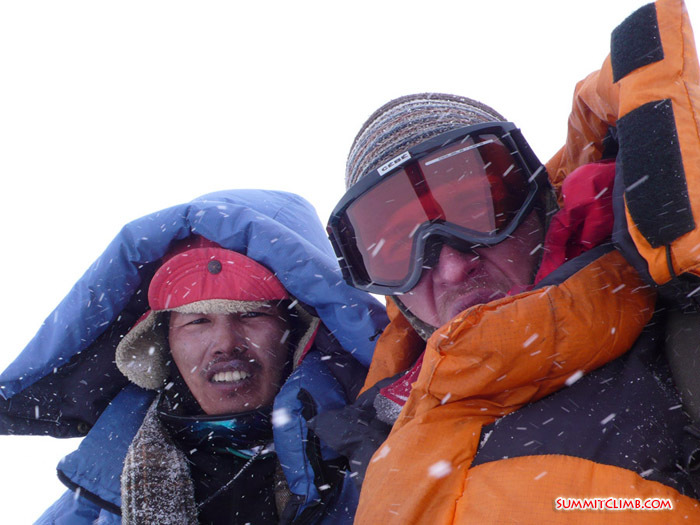 Mark descended to ABC this morning and Tony left the expedition due to health conditions. We’ll all miss Tony and wish him well. 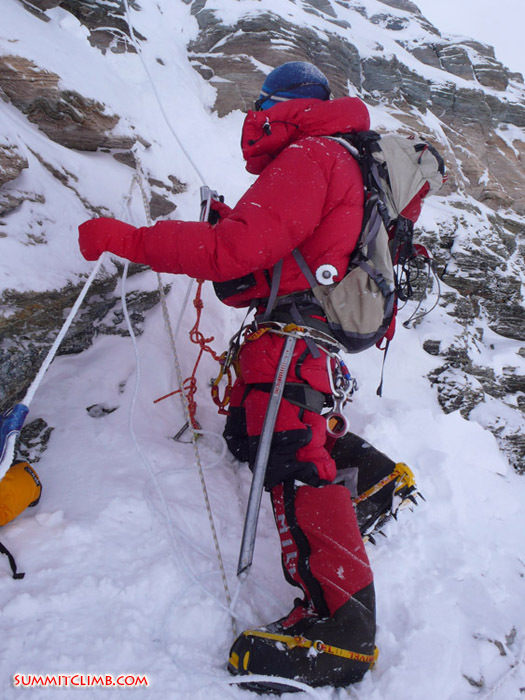 This morning the rest of the team climbed up above camp 1 to the 1st ice cliff to acclimatize. The weather’s been clearing most days by late morning and we hope to push to the summit in 10 days time. No one has yet been to the summit this season. 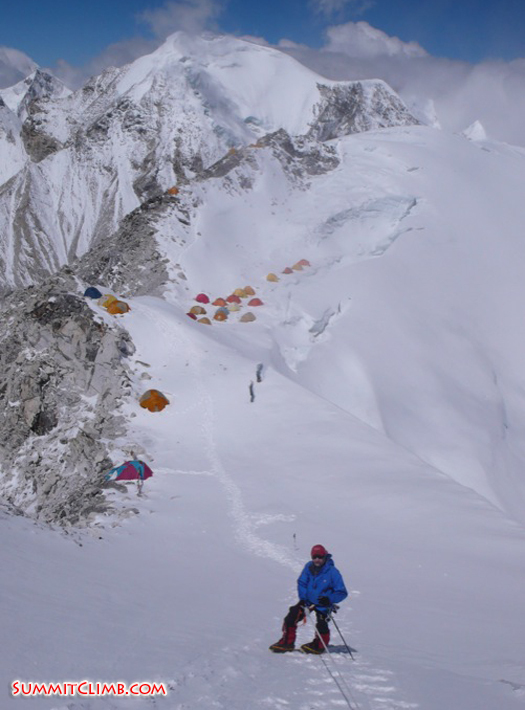 Two of our sherpas went up to establish camp 2 yesterday and only saw 1 other tent. Lots of the smaller teams are leaving the mountain due to bad weather and also because the route has not been established above camp 3. We have experienced extreme temperature changes whilst resting in our tents in camp 1. It’s gone from +35 degrees Centigrade to -5 degrees in 5 minutes. First views of Cho Oyu (Max Kausch). 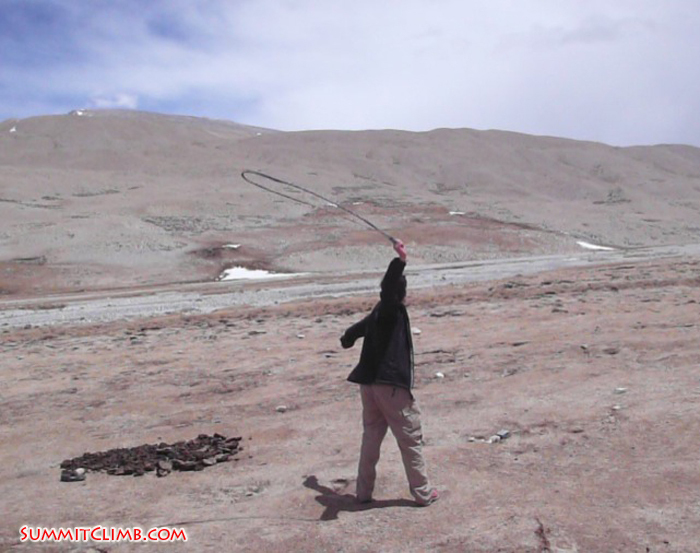 Alex training to use his Tibetan slingshot (Max Kausch). 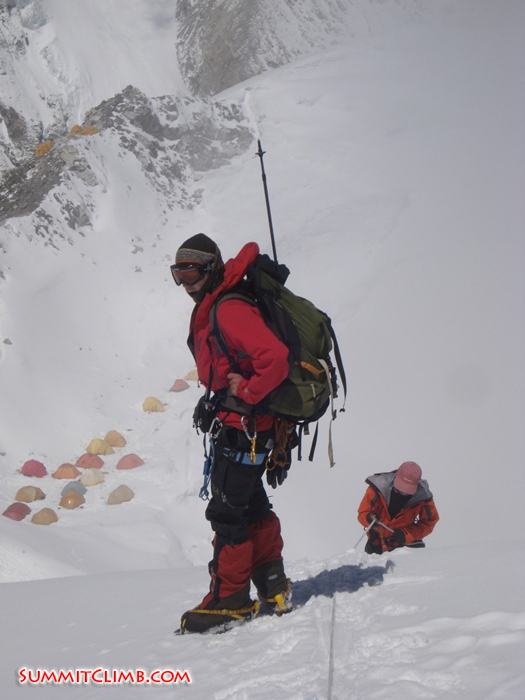 Hi, this is Max Kausch calling in a dispatch for the SummitClimb spring Cho Oyu expedition 2010. Today is the 7th of May. It’s been very productive lately. We had a puja yesterday to wish us good luck on our climb. It’s a Sherpa ceremony and it was pretty cool. We also all went up to camp 1 to take a load and then came back. Yesterday we did some glacier training and review to make sure everyone knows how to ascend and descend fixed ropes safely. The weather has been miserable lately for the last 4 days. It’s been snowing every morning, then afternoons are clear for a bit until it gets bad again. 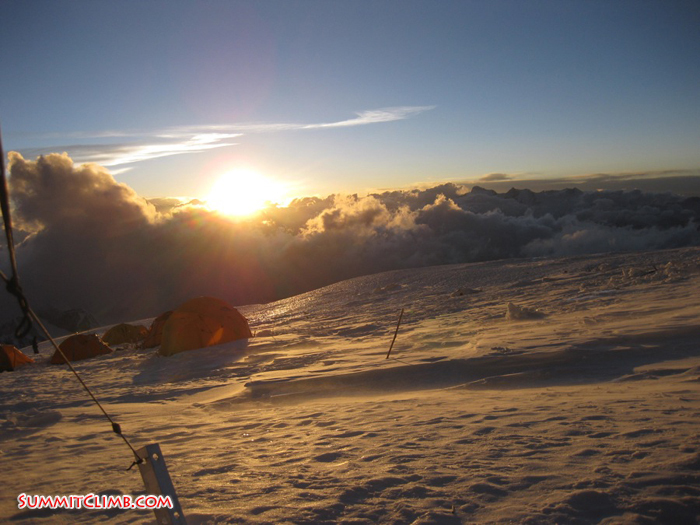 Today we will go to camp 1 at 6400 metres/21,000 feet and spend our first night there. Then we may try to explore the route to camp 2 and sleep back in camp 1 or ABC on the way down. Approach camp at 5100 metres (Max Kausch).Morning at basecamp (Max Kausch). 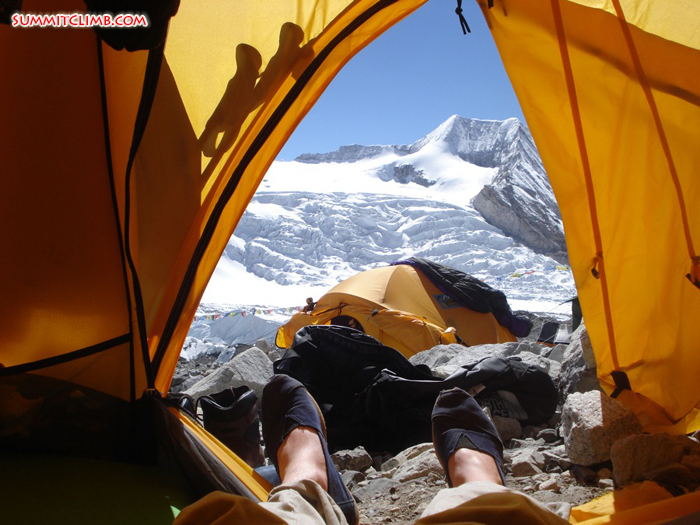 Hi, this is Max Kausch calling in a dispatch for the SummitClimb spring Cho Oyu 2010 expedition. 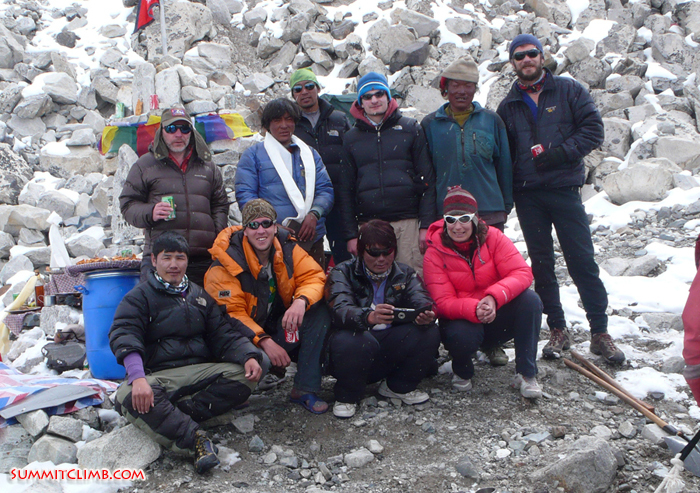 After 10 days of traveling, trekking and acclimatizing the whole team is up in Cho Oyu ABC. We set our camp here yesterday. It’s a pretty high camp to have as a base at 5700 metres/18,700 feet. We took it really easy on the acclimatization with good results. Everyone is doing well. Two members had mild headaches during the night, but they’re fine now. We’re all very happy to be here. So many things could have gone wrong on the way. Today we’re taking a rest day so we can start our first trip to camp 1 tomorrow. Camp 1 is at 6400 metres/21,000 feet. We’re going to carry a load to camp 1 tomorrow then come back to ABC. Today the staff is working on our toilette tent, shower tent, eating tent and solar charging system, which are all working well. 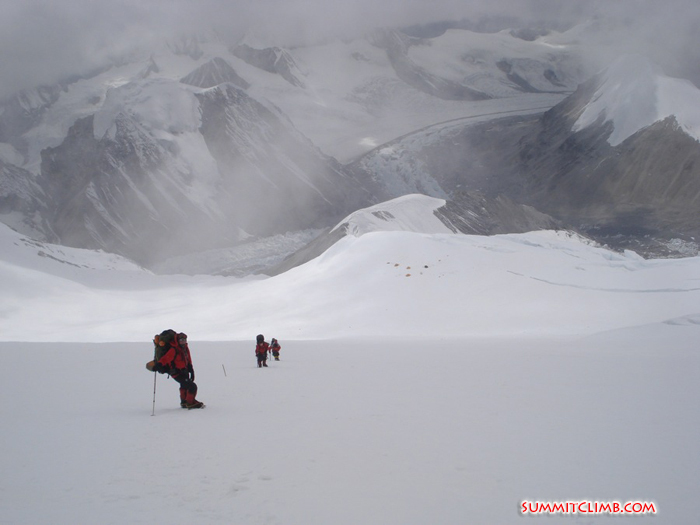 The weather has been pretty bad the last few days and a few expeditions returned from high camp to ABC. It’s a bit cloudy today, but we can see the whole route above camp 1 and we can even see a few climbers on their way to camp 2, but no one above going to camp 3. Mia approaching ABC 9Max Kausch). Our dining tent at ABC (Max Kausch). 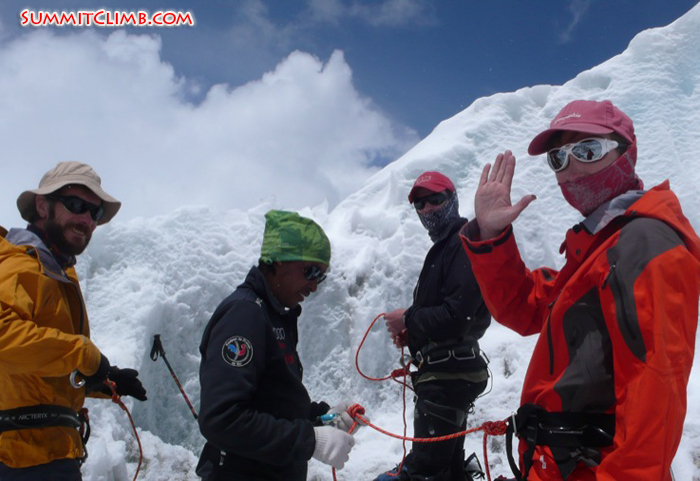 Hello, this is Mia calling in for the SummitClimb Cho Oyu expedition on the 2nd of May. I’m presently in my tent in interim camp at 5200 metres/17,100 feet. Last night we woke up to a big thunderstorm. The lightening was so bright that it lit the whole sky. It was really amazing. Then it started snowing and it’s been snowing ever since. 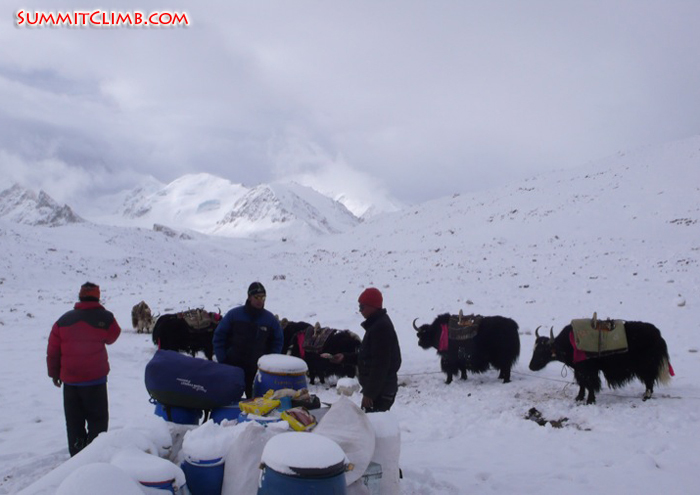 Today the yaks took some of our equipment up to ABC and we’re really hoping to go there tomorrow if it stops snowing. The weather has been generally windy and cold on the mountain and a steady stream of climbers has had to withdraw to ABC. Mark and Dorje installing prayer flags at ABC (Max Kausch). Members during glacier training (Max Kausch). Hi, this is Max Kausch calling in a dispatch for the SummitClimb Cho Oyu spring 2010 expedition. 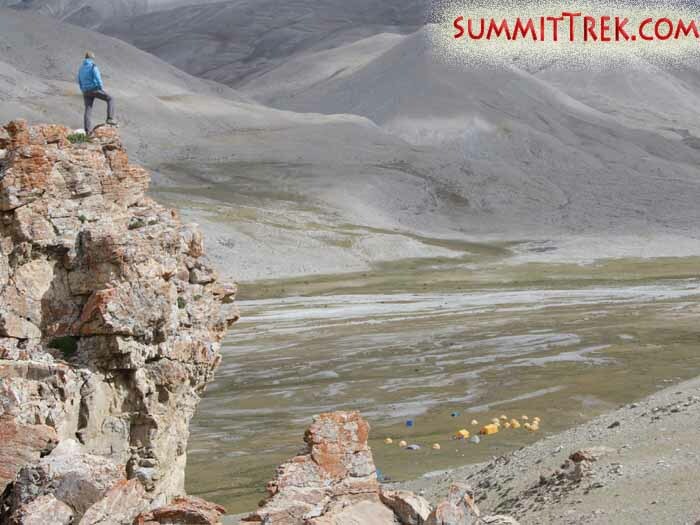 We made it to Chinese basecamp at almost 5000 metres/16,400 feet. Last night we had some snow, but the morning looks promising and the sun is coming out now. There is no wind whatsoever, which is great. Yesterday we got here and we’re leaving tomorrow morning to interim camp at 5200 metres/17,100 feet and we’ll spend 2 nights there. The team is responding very well to the acclimatization. We’re all doing great. No one is having any aches yet or any problems. We’re eating and drinking a lot, enjoying the awesome services of our great cook Dorje. From here we can see quite a few peaks, like Cho Oyu and a number of neighbouring peaks between 6000 and 7000 metres. We heard that there will be about 14 expeditions at ABC this year to share the mountain with us. 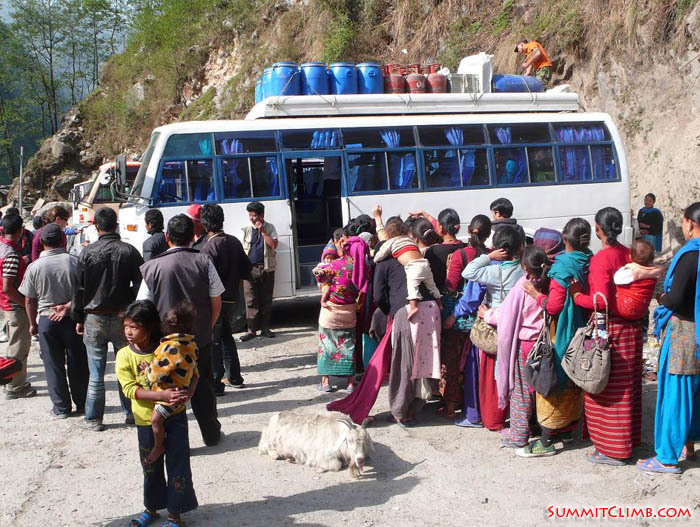 Some of them have already gone to high camps, which is always good news because we know the route will be open. A team member taking an adventurous acclimatization hike. In the distance below you can see basecamp (Samuli Mansikka). 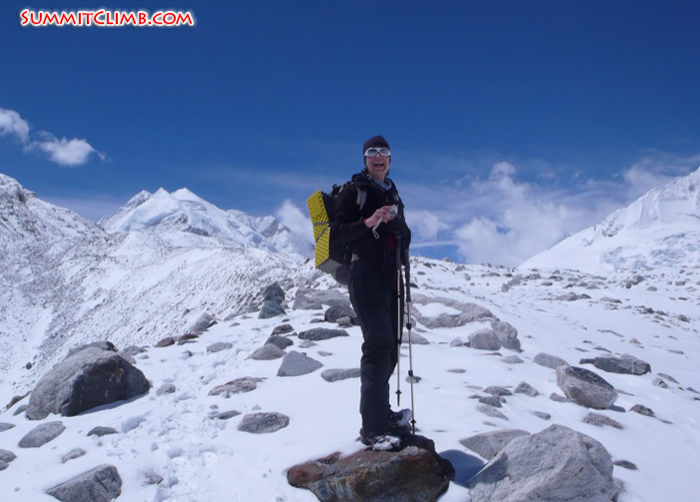 Hi, this is Max Kausch calling in for the SummitClimb spring Cho Oyu expedition. We made it to China!! Yesterday we left Kathmandu at 4am. There were a few strikes on the way and a few people with wooden bats. They were angry at something and blocked the road, burned tires, etc. Our agent Murari sorted everything out with talking. We love Murari! Eventually we made it to Kodari, the Nepali side of the border. We got there at 8:30am and crossed the border in only 1 hour. The Chinese were very friendly and let us cross with no problems. We had to change all our luggage to a Chinese truck and the Tibet Mountaineering Association provided us with SUVs to take us through Tibet. We went straight to Nyalam, at 3700m. Our itinerary is very slow to allow all members to acclimatise properly without altitude problems. So we are taking it very easy and spending a couple of nights in every single place, before reaching basecamp. We'll spend another night here in Nyalam and then head to Tingri (4300m) tomorrow after breakfast. We'll also spend 2 nights there. 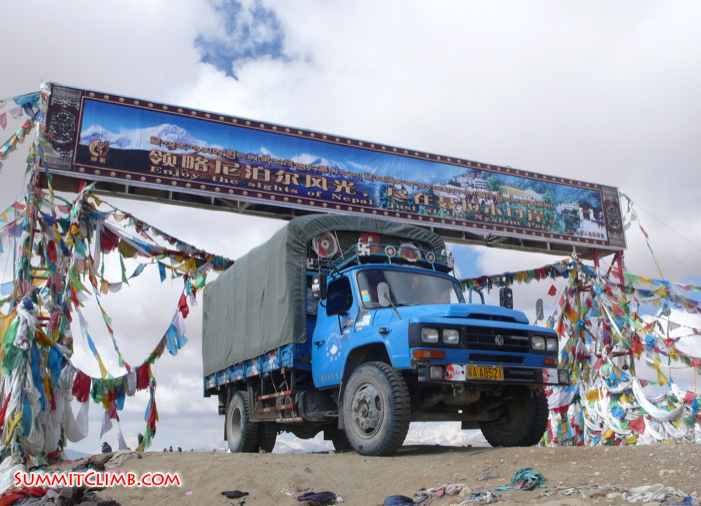 Then we'll drive to Chinese BC, at 4900m and spend a couple of nights. May 3rd is our estimated day to reach ABC, at 5600m, where we'll spend most of our time. Team on the bus to China. Unloading the bus in Kodari before the Chinese border (Max Kausch). This is Max Kausch writing for the SummitClimb Cho Oyu Spring 2010. Today is April 24t. The whole team made it safely to Kathmandu! Finally all the Cho Oyu members sat on a table together and enjoyed Nepali cuisine. Everyone is almost ready and buying the last bits of equipment and snacks at the busy Thamel. This spring looks very dry and dusty. Our agent Murari went to the Chinese embassy and got us a visa yesterday so we are now allowed to go to China. We will leave Kathmandu at 4am tomorrow (25th) and hope to cross the Chinese border at about 9am. If everything goes as planned, we'll go straight to Nyalam (3700m) and spend 2 nights there. We hope to drive back to Kathmandu around May 30th, but this can change depending on the progress of our expedition. 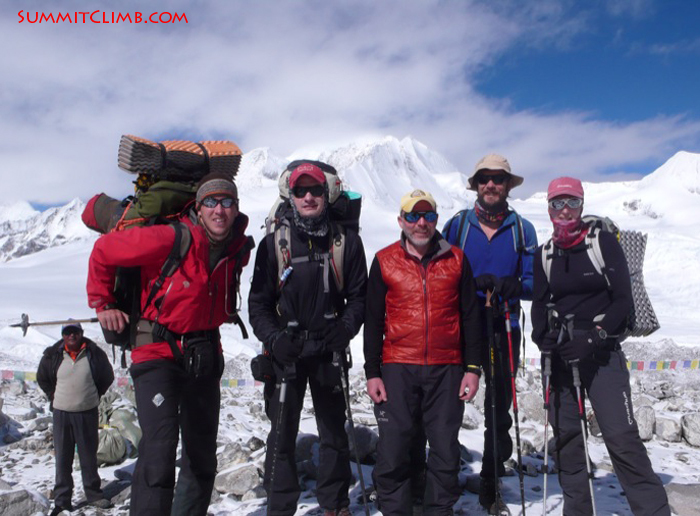 From left to right: Alex Holt (UK Cho Oyu member), Mark Solari (Australian Cho Oyu member), Jackie and John Foxcroft (they just came back from a trip to Everest basecamp but are stuck in Kathmandu due to the ash cloud), Anthony Newton (US Cho Oyu member), Abhi Rai (Everest View Glacier School leader) and Mia Graeffe (Finnish Cho Oyu member). 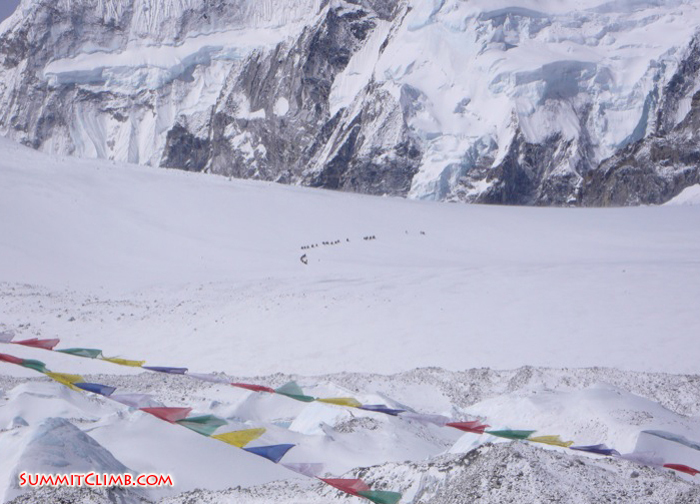 This is the first dispatch for the Cho Oyu Spring 2010 expedition. 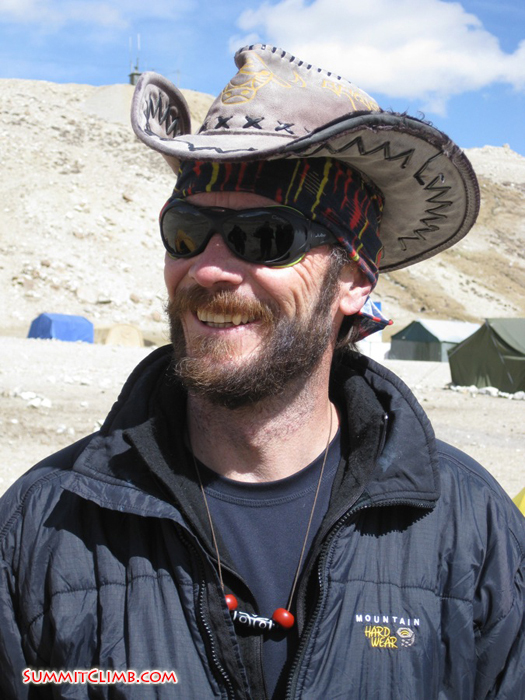 Today is April 21st 2010 and this is the expedition leader Max Kausch writing from Kathmandu. The city is fairly warm and we enjoyed 26ºC today. We had some rain during the last few days and this settled the dust a little. We are working hard on the preparations and packing for our expedition. Today all the staff helped to test our equipment. The first members will arrive tomorrow and we really look forward to meet them at the airport and show them around. 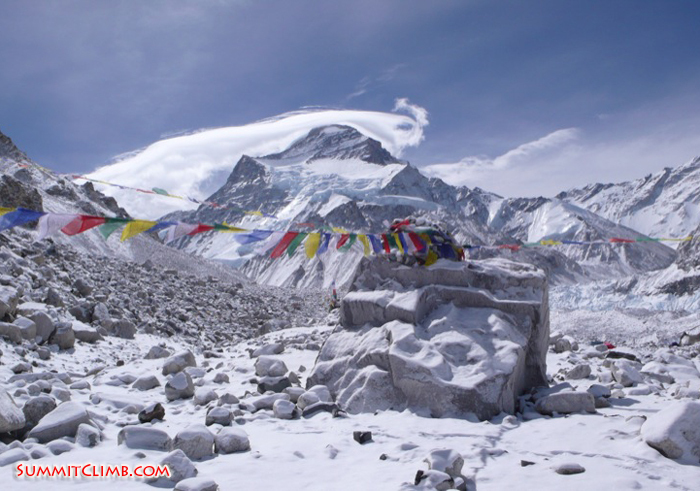 Our agent has already got a permit to climb Cho Oyu! We also wish the best luck for those who are traveling across the ash cloud that is sitting in northern Europe at the moment. 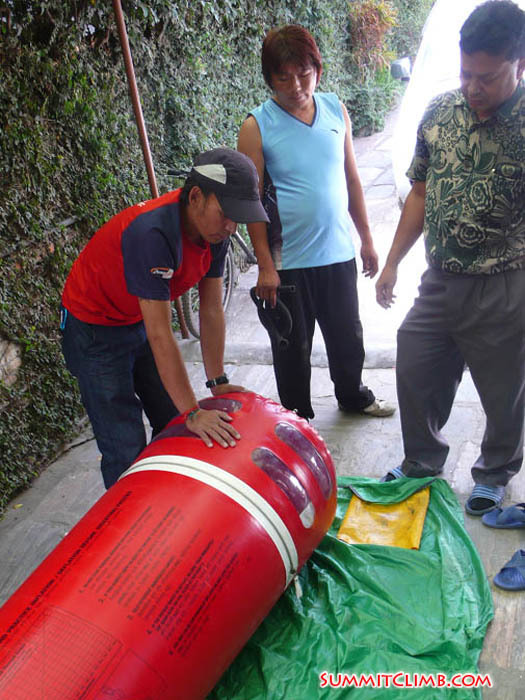 The staff testing the Gamow Bag in Kathmandu. 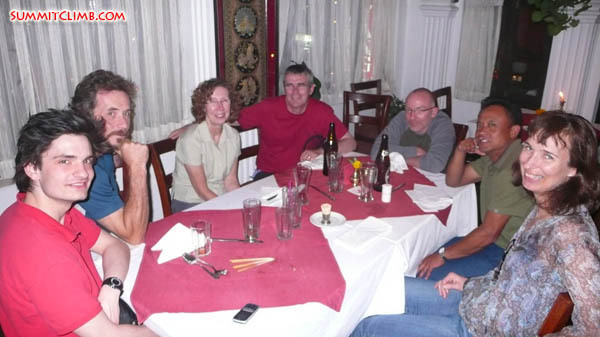 Murari (our awesome Kathmandu office manager) and all of the staff after work (Max Kausch).